Neon Town is a game developed by Treneon Games which seeks to revive the spirit of old school action games in a top down format while focusing on what made those games best, the challenging and rewarding boss battles. In the game, the player is dropped inside an unknown Transylvanian town, one which never sees daylight and illuminated by nothing other than a vast colorful landscape of neon lights. The town is stuck in purgatory, as the player tries to escape they must defeat 12 challenging bosses in their way with up to 14 different upgradable weapons. This is Tansel, I'm the lead and only programmer of Neon Town. I finally got the permission from Benjamin (the mastermind behind the game) to write devlogs; and took the time to send an update. To think that it's been more than a year since our last update, it sure looked like we were dead. But, no, we were not and we've been working on the game. It was kinda less talking and more working situation. Anyway. As I said, I'm the lead programmer. What I do is to create the structure of the game, write code for its every aspect, test to see if it's working correctly, take builds, send to Benjamin's way, receive feedback, re-iterate, send a new build, move onto the next issue at hand. Sounds like a vicious cycle, right? Well, would you like to have that visualized? We are using a Git repository for Neon Town, and I've used a tool (Gource) to visualize all actions taken in the Git history. It's kinda a visualization of game development process. What you see in the video is pretty much what I've been doing this whole time. It's really a downer to see how much work has been done in a time lapse though! Oh come on, at that specific insert date here I worked insert random number here hours to get it right! Well, basically it's this: I receive sprites and import them. Create scenes and animations from the assets I import. Write code for new bosses, enemies, player weapons. Test them. Import some other libraries or frameworks, clean up the legacy code. Fix the errors. Make necessary changes to behaviors. Push the changes to origin. Back to step one. Along the road, I've made some mistakes like this one though. But where does all these work got us? Now, I think it's better to show you what we've been doing. As you can see in the video, our first iteration of the Doctor boss was back in May 23th, 2015. And in the second part of the video, dated December 11th, 2016; you can see the current state of the same boss. I gotta say that I learned a lot, and with the game I transformed too. We've joined two expos in this time, and we've received quite a few nice words about the game. 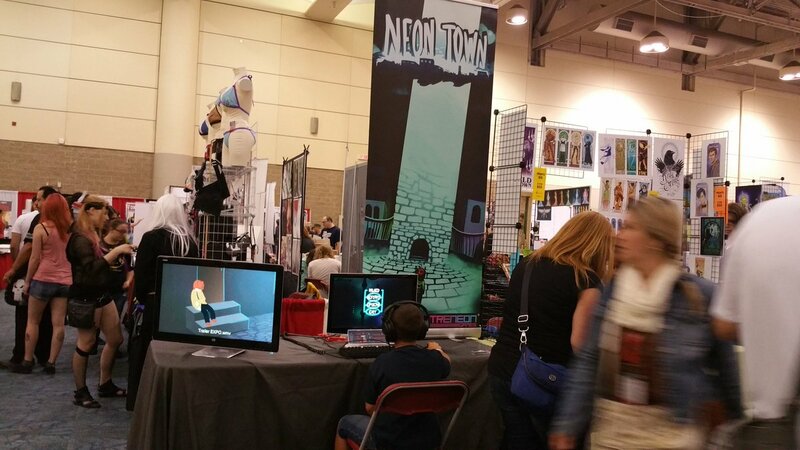 I've joined one, E-Game Show 2016; and Benjamin joined one, Toronto Fan Expo (picture below). It was really nice to see people enjoying the game. Don't worry if you haven't got the chance to attend any of those. Game will be released soon, and you'll get to enjoy the full experience. And who knows, maybe we'll release a demo (ask Benjamin, he knows). Well, aside from me working on the codebase? Treneon Games launches Steam Greenlight trailer for Transylvanian top down purgatory boss fighting game.